This set contains 2 face brushes for quick and easy foundation application. Apply with the F81 and stipple/buff with the F20 for a truly flawless finish. Both handmade from high quality, easy to wash anti-bacterial synthetic fibres. These brushes can be used with liquids, creams and powders. This curved shaped painter style brush is designed to create a flawless base. The F81's flexible flat fibres make it the perfect tool for 'painting' the face. Use this brush to apply cream or liquid foundation in smooth downward motions or gently patting product on to the face. For best results, buff out with a buffer brush such as the F20 or airbrush blender sponge after. 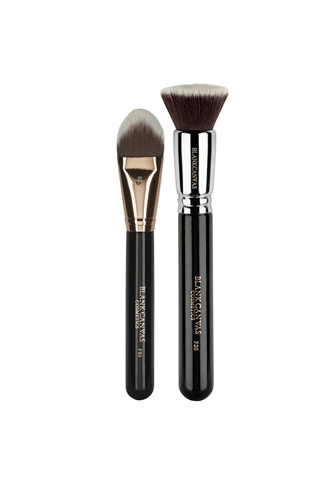 The F20 is our award winning, multi-purpose face brush designed to suit all skin types. Stipple or buff your foundation on with the F20.